"For collectors of more modest means, there were lots of cars selling below $100,000 or even under $50,000. A 1969 Ford Mustang Boss 302 Custom Convertible garnered $43,200; a 1967 Chevrolet Impala SS convertible, $25,920. In most cases, "ragtops" are much more valuable than sedans or coupes. 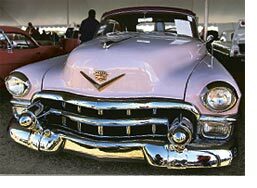 Craig Jackson sees a surge in interest for 1950s convertibles. "They're fun to take to events and pretty reliable," he said. "Reliable" has become a key word. Modern collectors' desire for driving their cars, rather than just admiring them, has had a huge impact on the marketplace. Twenty years ago, there were few events for old-car aficionados. Now, every weekend brings rallies, shows, scenic tours and competitions, to which collectors want to drive their cars. That's helped boost prices of cars new enough to be relatively dependable. It's also cut demand for pre-World-War-II autos, with the exception of the finest classics. The desire for drivability has a lot to do with the soaring popularity of muscle cars, the collectibles of choice for many baby-boomer males in their 50s and 60s. Most boomers hit age 18 at the height of muscle-car mania. Do the math, and you'll see that the boomers' impact -- and demand for muscle cars -- could remain robust for at least 20 years. In the past five years, prices for many of these cars have tripled or even quadrupled. The 1969 Camaro Z Coupes that sold for $29,000-$35,000 at Barrett-Jackson in 2001 brought $68,000-$108,000 this year. (An unrestored example with only 11,000 miles sold for an extraordinary $221,400). A 1970 Dodge Super Bee Hardtop went for $19,000 in 2001; a similar car sold this year for $72,000. Rocker Sammy Hagar's 1967 Shelby GT500 fetched $270,000, guitar and case of tequila included. 1984-89 Porsche 911s, especially Carreras. These drivable dreams are powerful and beautiful, with relatively uncomplicated flat-6 rear engines. The tiny rear seats are good only for small children, pets or luggage. Clean, good-running examples sell for $15,000-$25,000. They've bottomed out in price in recent years and should move up modestly if well-maintained. These kind of cars are sometimes called "equity protectors." 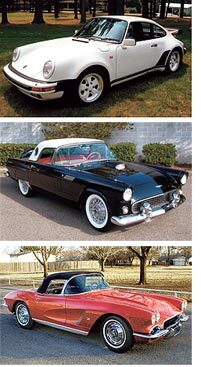 1955-1957 Ford Thunderbirds. These two-seat "Baby Birds" are American sweethearts. They got the name after Ford upsized the car in 1958. They come in a huge range of prices and conditions. Three 1956 models, all "frame-off" restorations, sold at Barrett-Jackson for $54,000, $57,240 and $70,200, respectively. Find a good one, save it for fair-weather Sunday driving and watch its value appreciate. Early-1960s Corvettes. America's first and greatest sports car. These are great vehicles, with which amateurs had racing success all across America. In the $75,000-to-$100,000 price range, there are many to pick from. To find a good one, look at the ads in Hemmings Motor News or contact a nearby Corvette owners club. Especially prized: 1961 or 1962 two-top fuel-injected models. Always go for the biggest engines with max power. Knock-off wheels and air conditioning add value.